I was intrigued by this summary immediately, and I had a certain idea of how this story should and would go. It lived up to its expectations perfectly. 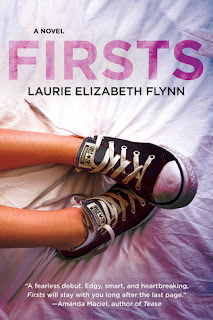 I read a similar story last year which, unfortunately, I couldn't even finish because of the way it was handled, but Laurie Elizabeth Flynn did an amazing job with Firsts. It grabbed me immediately and held on until the end. Mercedes was a unique character, and one with a unique situation. Who would think about offering high school guys lessons in how to make love to their virgin girlfriends just for the sake of making that girl's first time special. It immediately had me thinking about why this was so important to Mercedes that these girls have a special first time to lose their virginity. Turns out, Mercedes was very deep, there were many layers to her, and I enjoyed how these layers were pealed back one by one throughout the story in the most amazing and vulnerable way. Zach was an amazing guy, and I really loved him as a character. The romance between the two of them, however, was really secondary to what was really going on in this story. This book is all about Mercedes, what's in her head and heart, this service she performs for guys, and why her set amount somehow ends up not being enough and she keeps accepting more. Handled differently, Mercedes could have been a bad character that I wouldn't have been able to sympathize with at all. But I found myself loving her, crying for her, rooting for her, and waiting to see what would ultimately happy. This was a wonderful book, told in amazing and skillful way that tugged at my heart and had my emotions going. Excellent book.